The resort is located on Phuket's unspoilt northeast coast, on the northern tip of Por Bay, with its peaceful forests and fishing villages. It lies a 5-minute walk from the shingle beach, 25 minutes' drive from the Central Festival Phuket shopping centre and a 30-minute drive from Phuket Town. Phuket Airport is only 15 km away.The resort features 49 suites and villas, nestled on the gentle slopes of the headland amongst lush tropical gardens, with breathtaking views of sparkling seas and islands. 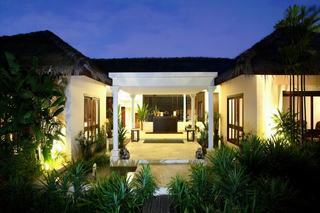 The focal point is the infinity swimming pool, just a few steps from the beach. With an intimate ambience, this family-friendly spa and beach resort is a haven of escape and tranquility. Facilities on offer to guests include a lobby area with a 24-hour reception and check-out service, a currency exchange facility, a hairdressing salon, a bar, 2 restaurants and WLAN/Internet access. Guests may also take advantage of the room and laundry services and there is parking for those arriving by car.The pool villas and hot tub suites offer space and privacy within the setting of a comfortable location, enjoying stunning panoramic views of the Andaman Sea. Moreover, a spacious terrace allows for private relaxation and all rooms have either their own pool or spa pool. All accommodation comes with a private bathroom with a shower/bathtub as well as a hairdryer, a direct dial telephone, satellite/cable TV, Internet access and a minibar. Furthermore, a fridge, a microwave, tea and coffee making facilities, an ironing set and a king-size or double bed are provided in all accommodation as standard. The rooms are also equipped with individually adjustable air conditioning and a safe. The hotel is set amid the beautiful scenery of green forest hills with a beautiful view of Po Bay on the North Eastern side of Phuket Island. The resort's private beach is a 5-minute walk away and it is only 20 minutes to Phuket town and a few minutes to the main pier. Thanks to its superior location, all guests' favourite off-site activities are within reach. It takes 15 minutes to get to Phuket International Airport.This club resort provides superior world-class services in addition to its luxury guestrooms, villas and all round facilities. Standing ten storeys high, guests' first impression of the main lobby is the panoramic ocean view of Phang-Nga Bay that can be seen from miles away. Designed and decorated in elegant Southern Thai style, the resort blends in nicely with the tropical forest surrounding it. It comprises a total of 182 accommodation units, including 144 rooms and 38 poolside villas. Facilities on offer to guests include a 24-hour reception, a hotel safe, a currency exchange facility, a games room, a restaurant, a games area. conference facilities and Internet access. Guests may also take advantage of the room and laundry services, parking (for an additional fee) and a garage.All sea view rooms and poolside villas feature the best of East Asian décor. Experience the supremely comfortable mix of European and Thai style, where the essence of escapism is captured for guests' ultimate relaxation. They come with a private bathroom with a shower/bathtub, a hairdryer, a direct dial telephone, satellite/cable TV and Internet access. Furthermore, a minibar, tea and coffee making facilities, an ironing set, a king-size or double bed and a safe are provided in all accommodation as standard. The accommodation is individually air-conditioned and features either a balcony or a terrace.